Driving is more than a form of transportation in Britain. It is a pastime and a passion. From James Bond’s gleaming Aston Martins to Sir Walter Owen’s regal Bentleys, Britain has had a long, winding love affair with driving. Located high up in the English hills of Peak District, this road offers the kind of tight bends that have come to typify roads in the area. The hills and slopes are steep, which means drivers need good wheels and even better instincts. 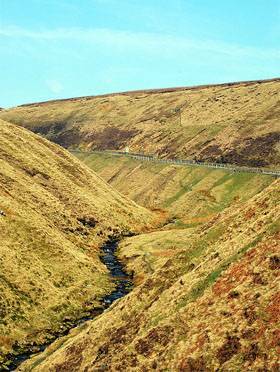 Snake Pass is regarded as one of the top classic British driving roads. Elan Valley is a 360 degree loop that passes through several majestic reservoirs that add to the already stunning panorama. Drivers can hit the road slowly, taking in the sights, or use their higher gears to turn it into a track. Buttertubs Pass is a high road, which means the air is sharp and crisp and the turns are tight. Drivers can take to it with different driving styles; just make sure to keep a watch out for the 20 meter-deep limestone potholes that have claimed many polished wheels. The Black Mountains offer maybe the best corners in all of Britain. Drivers are constantly accelerating and decelerating, gassing and breaking, just trying to make their way around the road’s disciplined angles. The mountains spread across southeast Wales like a dark stain, imposing and beautiful. Aberystwyth, known simply as Aber by locals, is a famous road located in a famous town. One reason why it’s such a popular holiday resort is because of the area’s grand, sweeping road. Some routes stretch for 20 or 30 miles, with no end or obstruction in sight. 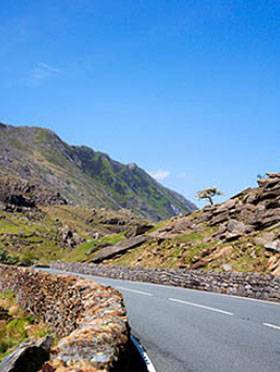 Between the mountain ranges of Glyderau and Snowdon lies the Pass of Llanberis, one of the best drives in Britain. The pass offers nearly every type of drive imaginable, attracting wheelmen from around the world. Car, truck or van – all are welcome here. The Leicestershire countryside is almost as memorable as the road that slices through it. The B6047 has tight bends and curves, but its best asset is its enormous hill, unconquerable by timid drivers. The Midlands, which runs through famous Nottingham, has an unequalled combination of long straights and tight twists. Drivers are never too far from their brake pedal. The B3135, which connects Cheddar and Ashwick, may seem like a small patch, but it delivers. At less than 15 miles long, it is one of the most driven roads in Britain. Watch out for the postmen on their bicycles and the farmers with their horse carts. This Scottish A-road is 140 miles of bony, narrows bends. Make sure the windows are rolled down to take in the country’s magnificent scents. These are just 10 of Britain’s classic driving roads. Get the map, compass and gloves and get ready to test Mother Nature’s racetracks. Sarah the author of the “10 Classic British Driving Roads” is a motor racing enthusiast and writes on-line on a number a car review websites.